Aeroprobe provides a complete Fast Response System (FRS) for five-hole probes that is designed to resolve unsteady flow angles and velocity. Pressure sensors are integrated into the Fast Response probe (FRP) body to maximize frequency response. A complete data acquisition module (FRM) is available that provides signal and power conditioning for the probe. The Fast Response Software suite allows for data transfer and the application of all calibrations. Our Fast Response probe has a maximum recoverable frequency of 4500 Hz and is constructed from stainless steel for durability. Unlike conventional high frequency response instrumentation, such as hot-wire anemometry, Fast Response probes do not require frequent recalibration to maintain their accuracy. Aeroprobe provides a data acquisition system specifically designed for Fast Response probes. 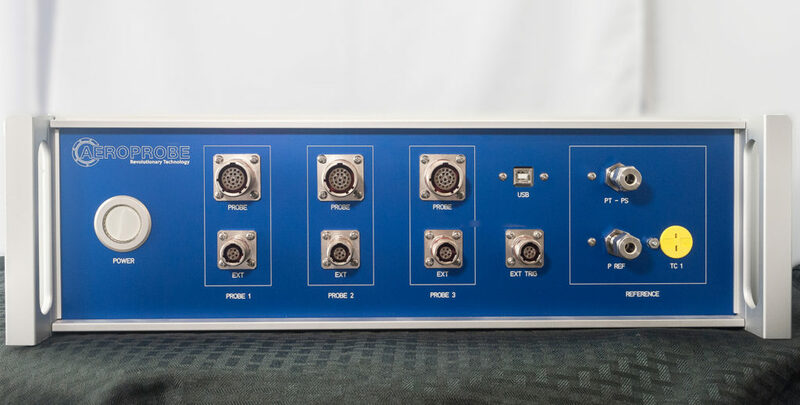 The rack mount module provides all necessary signal and power conditioning, as well as digital input and output triggers for seamless integration into existing data acquisition systems. The Fast Response Module includes reference pressure and temperature sensors required for multi-hole probe operation. A graphical user interface is provided for simple data acquisition and basic real-time plotting. Aerodynamics calibrations define the relationship between the measured probe port pressures and the airspeed and flow direction. The probe is placed in a known flow field and rotated to thousands of discrete calibration points per calibration Mach number. Our calibration wind tunnels are thoroughly characterized free jets, configured to allow continuous flow from 5 m/s to supersonic speeds. Acoustic Calibrations are performed to quantify the gain and phase lag between the fluctuating pressure signal at the probe tip and the measured signal acquired by the probe’s embedded sensors. This transfer function is measured via Aeroprobe’s Acoustic Calibration facility and software is provided to apply this calibration to recover frequencies up to 5000 Hz. Contact us today to learn more about our Fast Response System.